For the purposes of the Data Protection Act 2018 the controller is Greenstone+ Limited, a limited company registered in England (Number: 05757600) having its registered office at 5th Floor, Crown House, 143-147 Regent Street, London, W1B 4NR, United Kingdom. We may change this policy from time to time by updating this page. You should check this page from time to time to ensure that you are happy with any changes. This policy is effective from December 2018. If you contact us, we may keep a record of that correspondence and we may keep details of transactions that you carry out through our site. We may periodically contact you with promotional material by email, mail, fax, or telephone about new products or other information which we think you may find interesting using the contact details which you have provided. We may use the information to customise the website according to your areas of interest. We are committed to ensuring that your information is secure and all personal data is collected and handled according to the prevailing data protection legislation. In order to prevent unauthorised access or disclosure, we have put in place appropriate physical, electronic and managerial procedures to safeguard and secure the information we collect online. Except for essential cookies, you can choose to accept or decline cookies. Most web browsers automatically accept cookies, but you can usually modify your browser setting to decline cookies if you prefer. This may prevent you from taking full advantage of the website. Essential cookies are necessary to provide you with services available through our site and to enable you to use some of its features. For example, they allow you to log in to secure areas of our site and help the content of the pages you request load quickly. Without these cookies, the services that you have asked for cannot be provided. We only use these cookies to provide you with those services. Details of the specific cookies which we use are set out below. If you fill out a form on the Greenstone website (e.g. registering for a webinar, subscribing to our blog or downloading a guide) your email address will be added to our mailing list of those who may receive email messages with industry news, webinar invitations and newsletters. You can change your email preferences by clicking on the 'email preferences' link in the email footer. You can also ‘opt-out’ all together by clicking ‘unsubscribe’ in the email footer. We will always treat your personal data with respect and other than as specified below, will never share it with third parties without telling you first. If you have any questions or concerns about how your data is used, please contact us on datasecurity@greenstoneplus.com . We share your data with your third party service provider, HubSpot, that provides customer relationship management and marketing services to us. 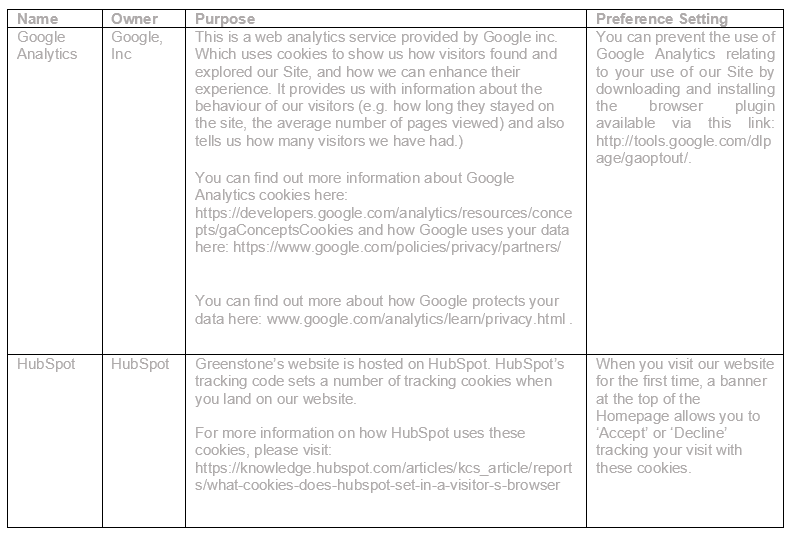 See the “Location of Your Data” section for more information about HubSpot. If Greenstone+ or substantially all of its assets are acquired by a third party, in which case personal data held by it about its customers will be one of the transferred assets. We rely on legitimate interests to send marketing messages and material to you, where not outweighed by your interests or fundamental rights and freedoms. The legitimate interests we rely on for this processing are: to promote our products and services to you, and issue our direct marketing materials to you. You have a right to object and to seek to restrict such processing. See the “Your Rights” section for more information on how to exercise your right to object. Generally, if you are a customer of our products and services, you may not opt-out of software service or technical support related announcements, which are not promotional in nature. We will also offer you the opportunity to choose (opt-out) whether your personal data is (a) to be disclosed to a third party, or (b) to be used for a purpose other than the purpose for which it was originally collected or subsequently authorised by you. Questions regarding procedures, or requests to opt-out, should be directed to datasecurity@greenstoneplus.com . Whenever we transfer your personal information out of the European Union, we ensure a similar degree of protection is afforded to it by ensuring that the organisation to which it is transferred is E.U.-U.S. Privacy Shield Framework certified or alternatively that at least one of the other European Commission safeguards is implemented such as European Union approved Standard Contractual Clauses. We use HubSpot to provide our customer relationship management and marketing services. Currently, the primary HubSpot infrastructure is hosted with Amazon Web Services in the US-East-1 region. Amazon Web Services maintains ISO 27001, SOC 2 Type II, and several other certifications to demonstrate the rigor of their hosting and infrastructure management program. Information about AWS certifications is available on the AWS Security Compliance site. We keep your data for so long as it is necessary to fulfil the purpose for which it was collected. Therefore, we will retain your personal data for as long as your account is active or as needed to provide you services. To determine the appropriate retention period, we consider the amount, nature, and sensitivity of the personal data, the potential risk of harm from unauthorised use or disclosure of your personal data, the purposes for which we process your personal data and whether we can achieve those purposes through other means, and the applicable legal requirements. to enforce our agreements e.g. if your agreement has been terminated for breach then we may keep your data after termination to ensure that your account is properly closed. know what right you want to exercise and the information to which your request relates.